I need some idea of how to create a volume slider, however I don't want a boring slider. What I have in mind is more like a volume knob, that you actually turn by dragging in a similar way as a slider. Note: Gavin sent along this jpg to illustrate. 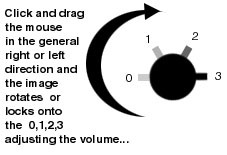 Instead of only having 3 or 4 divisions for your knob, let's have a range from 0-7, which corresponds to the possible values for "soundLevel" -- 0 being no sound, and 7 being the maximum volume. Note thate soundLevel is a system wide setting, so your computer's volume is actually affected. If you only want to change the volume of a single sprite, you should use "the volume of sprite (x)" instead of soundLevel. In Director 7, you have the ability to rotate sprites. In fact, there's a great behavior called "Drag to Rotate" that comes in the library palette. This behavior (written by James Newton, I believe) allows you to click and drag-rotate a sprite around and around. This is what we want to do, except that we want to add two characteristics to it. First, we want to limit the range of the rotation (from 0 to 180 degrees). Second we want to have the dial "click-rotate" -- only rotate to set detente points in the rotation. Download a sample movie in Mac or PC format. Instead of starting from scratch, let's start with the Drag to Rotate behavior and make some modifications. Before you get freaked out by the complexity of the overall behavior, keep in mind that we don't really have to understand all of the slope calculations that it does. All we need to do is find the point in the behavior where the rotation of the sprite is finally set. That happens in the "on Turn me" handler. Here's what it looks like un-modified. Note that the third line is where the rotation is set. So, we'll jump in right before that line to make our modifications -- based on the value of "newAngle". Understand how that works? Now let's look at that second characteristic -- rotation that snaps to click points on the dial. In the image of the dialog box above, you'll see I've asked how many click points there are on the dial. This will allow you to reuse the behavior in many applications. For our example, we want 8 click points (corresponding to 0, 1, 2, 3, 4, 5, 6, and 7 on the dial). In order to make this work, I declared two additional properties: pMarks which is the value entered by the author in that dialog box, and another property called pClickAngle. This is the angle of rotation between each click mark. That value can be calculated automatically if you know pMarks. Since the author supplies the value for pMarks, I did the following calculation in the "on initialize me" handler (which is called from the beginsprite handler). The variable range is set by subtracting the low limit from the high limit. In our example that value is 180. I multiply it by 1.0000 to make it a 4 decimal place float value (so that the following calculation will be most accurate.) Then I set pClickAngle by dividing that range by the number of click marks (minus 1) which the author specified. I subtract 1 from that value because between 0 and 7, there 8 clicks, but only 7 "pieces of pie". In our example, a range of 180.0000 divided by 7 pieces of pie will give us 25.7143 degrees per segment. Now that we've laid the groundwork, let's look at the modified "on Turn me" handler. I've commented each step. The essence of these modifications is to jump into the behavior after the newAngle has been calculated, then converting newAngle's value with some math formulas into the values which we need. Since Director allows rotation values of plus or minus 21 million, we start by converting it to a value between -360 and 360. We use the mod function for that. Next, we want to convert this value to one between 0 and 360. For example, a rotation of -270 (which is lower than our lowest limit) would be converted to 90 (which is an acceptable value between our low and high limits). To do this, we simply add 360 to any value below 0. The next step tests to see if the current value for newAngle is between our low and high limits (0-180). If not, nothing happens and the dial doesn't change position. But, if the value is acceptable, the following calculations are needed. We need to convert the value to an integer between 0 and 7. Actually, 7 is just what we're using in our example. More generically, we need to convert newAngle to an integer between 0 and (pMarks - 1). To do that, we simply divide newAngle by the degrees per click (pClickAngle) and round it off to an integer. It happens that in our example we can use this value of whichClick to set our soundLevel -- which I do immediately after the last line of code. However, you can comment out that soundLevel line if you want to use this behavior for another purpose. You'd insert whatever you want to do at that point. Finally, we need to figure out exactly what angle of rotation is needed to correspond to whichClick. To do that, we simply multiply whichClick by the pClickAngle. That ends our modifications. The final line was in the behavior previously. It sets the rotation of the sprite to the value of newAngle. I hope you find this behavior helpful. More than that, I hope this illustrates an approach to modifying existing behaviors for your own purposes. It's like hacking -- you don't have to understand everything about what was there before. You can simply figure out where to "jump in" and "jump out".